We didn’t oust Morsi for his diplomatic or economic failures- you’ll be surprised to find out how adaptively everyday Egyptians, over the heavy years, learned to live with such failures. We ousted him, by a revolution, for his loyalty to the MB was far more than to the state of Egypt. (ALEXANDRIA, Egypt) - Now it has become clearer than ever that Aljazeera is waging a war against Egypt. Well, actually to be specific and avoid any hint of exaggeration, Aljazeera and a bunch of others, e.g. The White House, EU, Tel Aviv and Western Zionism … oh my gosh, almost forgot, our beloved Qatar- that cute little Gulf county is so tiny it’s almost ½ the size of Tahrir Square. Though we live in the so called world of information, yet we are soaked to the eye brows in total deception and misinformation. We need, more than ever, to know what’s really happening next door and everywhere on the globe. And instead of properly and ethically satisfying that human need, MSM has become the main stream of distorted truth. A lot of factors and powers are at work here, but the benefit of those controlling the media has become the only authority deciding how and when this distorted truth hits the market. And we are currently witnessing the big time to flood Egypt with MSM propaganda drones. A blatant example for this distortion is the Qatari Aljazeera. Besides manipulating the truth by being selective which side to shed light on and which to dim to complete darkness, Aljazeera decided to fabricate the whole thing all together. The fact that Qatar is one of the main sponsors and financers of the Muslim Brotherhood is no secret. Since the fall of the MB by the Egyptian uprising in June 30, and the channel’s anti-Egyptian attitude has aggressively taken new dimensions and shape. And since the pace of developments in the Egyptian scene has been hectic, Aljazeera staff had to breathlessly keep up with updates and sometimes ahead of them – By fabricating non-existing stories. Moving rapidly trying to cover nonstop events and updates, Aljazeera staff, in the Doha headquarters and on Egyptian ground, had to sometimes lose their subtleness, operate sloppily and to forget to cover their tracks. 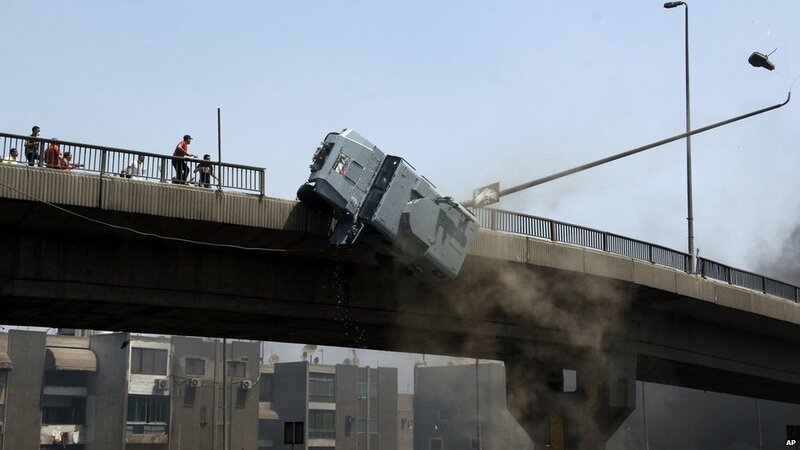 Armoured police vehicle pushed off a bridge near Ramses, downtown Cairo, by violent MB mob. In all MB rallies Aljazeera makes sure that one of its correspondents, and if not available one of the MB experienced members, is inside the event equipped with live streaming gadget- smart phone, laptop or ipad and high quality audio Mic. The live stream is of double benefit; transmitting the event from the side and MB/Aljazeera perspective … and also to take instructions from Aljazeera headquarters as how to act and what to say in front of cameras in a certain situation to achieve the desired effect. On Friday August 16, the MB rallied to downtown Cairo, Ramses square, in what they called the Friday of rage. Heads of MB assured the Qataris and the American embassy in Cairo which closed for the day, that the rallies will be so powerful and sweeping that once they reach Ramses square, they will declare their regime re-instated. The rallies included units of MB militants plus foreign agents from Hamas, Syria and Pakistan. Rounds of live bullets were heard and sometimes caught on camera targeting the armless civilians on the street and onlookers from windows and balconies in a way that would invoke fear and panic amongst the Egyptians. MB managed to finally reach Ramses square, because they were allowed to rally as equal Egyptian citizens, but the minute they reached the square they acted as citizens of another nation and with different identity. The excited MB crowd, all of a sudden, encircled a small car that we later knew harbored one of the MB leaders, Saad Emara, and one of the crowd around the car grabbed a flag from the trunk of the car and raised it amidst tides of jubilation and arrogance. And did they raise the Egyptian flag or the MB one, no; they raised and started waving the black flag of Al-Qaeda in a victorious way. That’s for me is terrorism in the wind. The hidden target of the MB, which the western media and political circles are aware of but prefer to put a lid on, is turning the republic of Egypt into an Islamic emirate similar to the Taliban emirate. 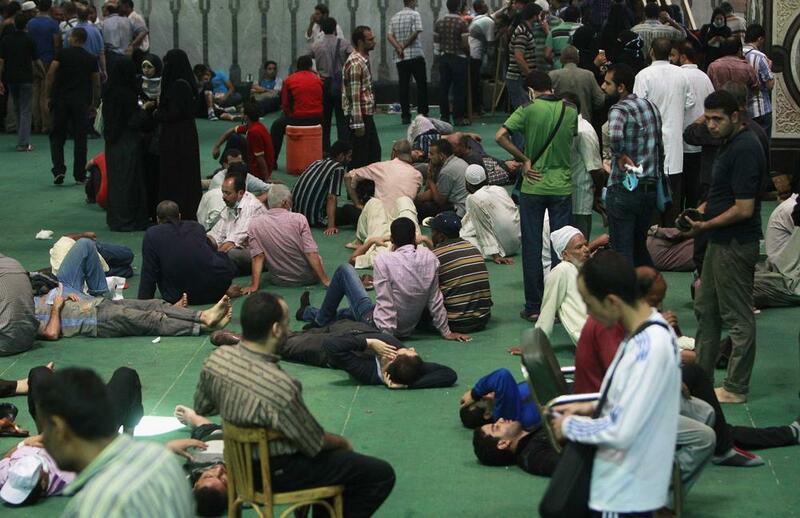 This is an international crime against the people of Egypt. This is tantamount to national identity cleansing. This is a monstrous conspiracy that no democracy of the so called free world should subscribe to, that’s why this solidarity with MB has to take more appealing titles and more deceiving media coverage. This whole depraved politics has to aesthetically look pro-democratic. Wake up free world. This is Ladies and Gents the core of the current Egyptian issue, this whole thing is not about breaching the norms of democracy and it’s not about some coup, many of the conspiracy addicts are currently and brilliantly exposing its funding by some covert US or Saudi government department. What has taken place in Egypt is not about crucifying the MB and ousting an elected president, it is about hijacking a nation and its identity by a terrorist group whose interests are compatible with the Zionist American agenda for the Middle East. What has happened in Egypt, believe it or not, is a revolution. It is as bloody simple as that. Some of the pro-Morsi writers and analysts, including European and American, often build their pro-MB thesis by saying “look we admit the man did mistakes, he failed to tackle the economic and political crises of Egypt but that doesn’t give the army the right to kick him out by a coup. Actually, this is completely the wrong thesis; we didn’t oust Morsi for his diplomatic or economic failures- you’ll be surprised to find out how adaptively everyday Egyptians, over the heavy years, learned to live with such failures. We ousted him, by a revolution, for his loyalty to the terrorist group of MB was far more than to the state of Egypt. Again, MB, unlike any political party in the so called free world, doesn’t feel like related to the Egyptian strategic interest or security – simply because the MB organization has its own agenda and goal. And ironically, MB used the Egyptian presidency to reach and fulfill that goal. MB doesn’t believe that citizenship should be defined by belonging to one’s homeland and sharing and cherishing its history and traditions, but rather by a citizen’s religion. 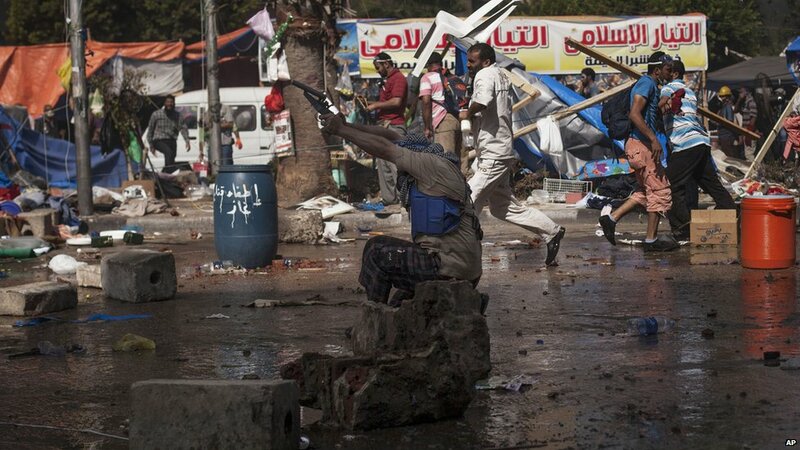 MB doesn’t see that all citizens have equal rights and obligations. Non-Muslim Egyptians, be they Christian Orthodox, Catholic, Baha’is, Shiites, or even Atheists are citizens of a lesser god. And again, that’s for me is the very definition of terrorism. This is a medieval and obscurantist tribal definition of citizenship. This kind of definition that has been applied before in other countries that subscribed to MB political Islam, e.g. Sudan, is bound to ultimately divide Egypt into two states, exactly like what has taken place in Sudan. MY dear western analysts, political experts and pundits; any MB member usually defines himself as a fundamentalist Muslim who happened, by the rule of mere genetic coincidence, to dwell on Egyptian land. In other words, a Muslim from Afghanistan or Yemen or Somalia could be closer to him than, say for instance, an Egyptian Coptic Christian. My dear sophisticated western intellectuals, in your fervent support for the MB, you are quite painfully blind to the fact that MB might go along with you as long as you’ll assist them to rise to power once again, and maybe foolishly subscribe to the foreseeable UN sanctions on Egypt. 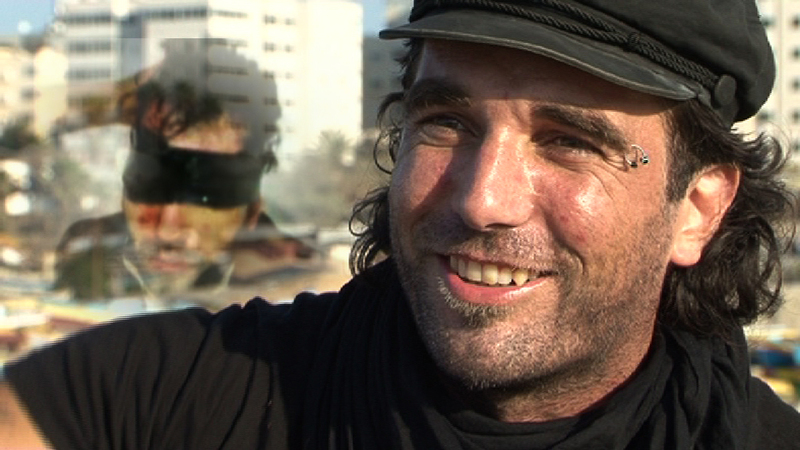 But any MB will not hesitate, not for a second, to slaughter you and your likes of the infidels, and leave you to rot hanging by the neck, as the MB perverted dogma preaches- May the soul of Vittorio Arrigoni, if you still remember him, who was slaughtered by MB of Gaza, rest in peace. >My dear western intellectuals and staunch human rights watchdogs, you’re simply patting the head of the big bad wolf. And if you are let in on the filthy deal the west is in with the MB, you will soon discover that it is worth the risk of instigating a civil war in Egypt; for selling a big chunk of the Egyptian land, namely Sinai to the Israeli/Hamas side is the price of re-instating the MB in Egypt. MB, financed by the satellite country of Qatar, and backed by the White house, EU and Tel Aviv, is trying to gain hold once again of the Egyptian state. And in doing so all kinds of dirty diplomacy, intelligence and propaganda are being played out in day light and with unprecedented political debauchery. Back to Ramses square, and when the local community of Ramses and adjacent neighborhoods saw this al-Qaeda rally getting more violent and way out of line, they were so provoked they started dispersing MB rally and chasing the militarized group with the al-Qaeda flag. The Police forces joined the local community and the al-Qaeda flag group found no way to run, and the only place for them to hide was inside a big mosque in the periphery of Ramses square, known as Fateh Mosque. The MB militarized unit took refuge inside the Fateh mosque and since this group was the front- line in the MB rally, it had to include a leading figure of the MB and of course Al Jazeera live streaming unit. The trapped group refused to go out of the mosque fearing they might get arrested. And while the majority had nothing to fear, certainly Saad Emara, the MB leader was bound to get arrested for instigating violence and acts of terrorism. On contacting Al Jazeera, the trapped group was told to calm down and do as the headquarters tell them. They were told that the only way out is to pull a big stunt, a live make-believe show for the whole world to see. The Group was told to make some of their members act like they were severely wounded; their forearms and heads wrapped with bandages. And moreover, others were told to play the dead; yes the dead, lie on the ground with their eyes shot and clothes soaked in red anti-septic solutions and make believe they were shot dead in the head and abdomen. The trick was huge; a MB woman, by the name of Shaima, who was conducting the live streaming from inside the mosque was the one doing most of the talking. Aljazeera broadcaster: let me repeat what shaima said, there are thousands trapped and they refuse the military proposal to leave the mosque for fear of arrest and persecution. ulShaima: I have with me some of the brothers who want the whole world to know they are armless and have nothing on them except the Koran. Aljazeera broadcaster: The hostages implore the free world, the NGOs, the UN and the Security Council to intervene and save them. A few minutes later, and as our Shaima was taking 5 to rest, she gave the ipad to one of the brothers to do some panning of the mosque and zooming on the wounded and those playing dead lying on the floor. But as I mentioned before, and due to sloppiness of some of Al Jazeera crew and the MB inexperienced members, the viewers were in for the surprise of a life time. As the camera was panning, it suddenly zoomed in a young man lying on the floor. He was motionless he nearly seemed like in a death coma. He was wounded in the head and his shirt was stained with what seemed like a large leaking abdominal wound. It looked like the poor man was hit by a live bullet that somehow penetrated his abdomen. The size of the bloody stain and the state of unconsciousness of the wounded man made one of the brothers who was not aware of Al Jazeera scheme try and check on the fatal wound. And as the MB fellow was pulling up the bloody shirt guess what happened; the wounded man, taken by the surprise, woke up from his coma and kicked the hell out of his MB fellow for revealing the deception. And guess again what; there was no wound, not even a scratch; his abdomen was normal and ok. His bare abdomen allowed the bare truth to unravel. Watch video of Aljazeera and MB deception caught on camera. Yes, ladies and gentlemen, the wounded MB man who was bleeding to death on the ground of the mosque was pulling out a stunt. Wake up ‘free world’ … Al Jazeera, the MSM and the American and European Zionism are pulling a cheap trick on you and playing you all for a bunch of fools. Don’t fall for the trick. The MB is an extremist group, with an appetite for religious fascism, endorsed by an international terrorist mafia. What is happening in Egypt is history in the making. Don’t stand on the wrong side of history, for what happens in Egypt will not eventually stay in Egypt. Dr. Ashraf Ezzat is an Egyptian medical doctor whose passion has always been writing. He says of all the human-related studies, he finds himself attracted to history. Ashraf stresses that history helps us understand change and how the society we live in came to be. He says Egyptology holds a special place in his heart, for Egypt is where the human conscience sprouted. In ancient Egypt all things civilized began to evolve. "I write articles and share posts of interest to me and hopefully to a lot of people." Dr. Ashraf Ezzat says you can drop him a line any time at: amenhotep.55@gmail.com "I like to exchange knowledge and experience, I think that`s what Blogging is all about." Obama has a lot of blood on his hands. He is responsible for the rise of MB. They are even in the White House. 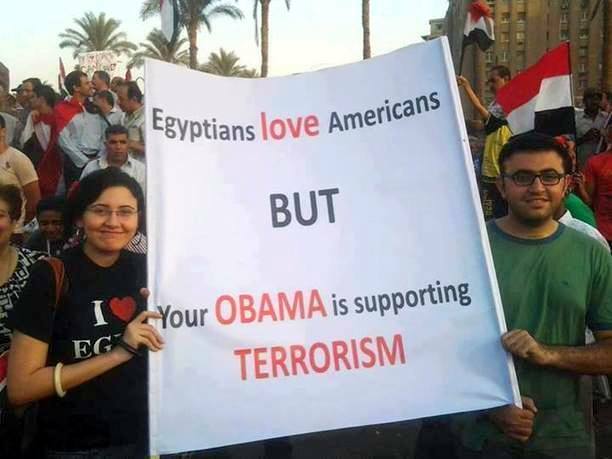 Obama is a terrorist for supporting terrorism. He is a murderer. No better than the MB.